Here’s another stairs-and-paths walk from Charles Fleming’s Secret Stairs East Bay covering Albany Hill, the “little hill” for which the city of El Cerrito is named. I covered its geology last month for KQED Quest Science Blogs, so this post is more about the details of what you’ll see as you take walk 35. Here’s the route map starting from the El Cerrito Plaza BART station. In the book, the route starts at San Pablo and Washington, but I have an extra path that’s not in the book. The numbers represent the photos in this post. Next is the topography . . .
. . . and here’s the geology. The geology’s pretty simple: the hill itself is typical Franciscan sandstone of the Novato Quarry terrane, surrounded by Quaternary sediment shed from the Berkeley Hills. Cerrito Creek runs past its north end, and Marin Creek’s drainage lies to its south. The divide between them is a low ridge of older alluvium where Solano Avenue runs. This accident of topography, making Solano a ridge route, is a subtle but important part of that street’s charm (like Park Boulevard in Oakland). We start to hit bedrock around the first set of steps—duh! That’s what makes the hill so steep. This set of steps, Catherine’s Walk, is the worst. Now it’s worth looking around as you proceed. First come views west over the Bay. 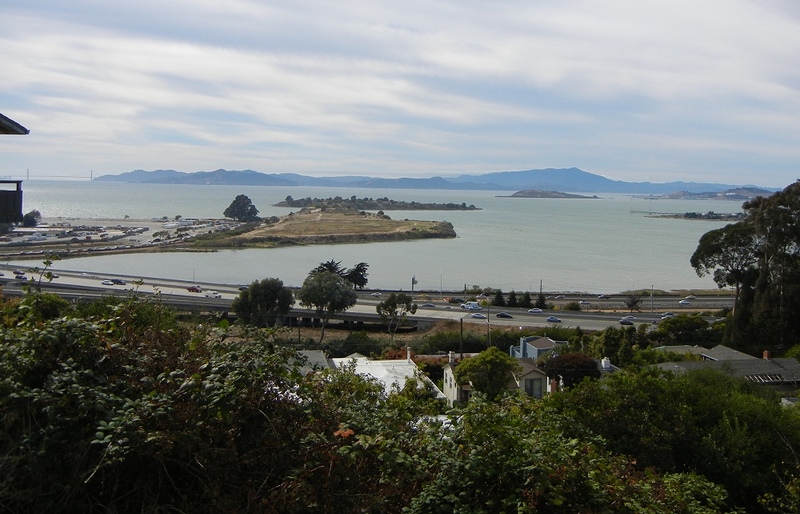 Click this one for a 1000-pixel version: in the Bay, left to right, are the Albany Bulb, Brooks Island, Point Isabel and Point Richmond; across the Bay are the Golden Gate, Marin Headlands, Angel Island, Tiburon Peninsula and Mount Tam, each and all worthy geological outings. Once you enter Albany Hill Park the bedrock starts to emerge more. The real opportunity to inspect and sample it comes later, though. Up here you start getting views to the east. The rocks in the Berkeley/Oakland Hills are much younger than where we stand: about 10 million years old as compared to the 80-ish million years of the Franciscan here. At the park’s north end we hit the top of Taft Avenue and take it down the east side of the hill. Don’t miss the view south. Behind the downtown Oakland skyline is Black Mountain, south of Palo Alto. Along Taft is a long roadcut where you can poke and bang the bedrock to your heart’s content. Unfortunately it’s pretty featureless sandstone. It points to a geographic setting, long ago, when huge quantities of fresh sand were being generated and carried offshore to waiting basins, perhaps at the bottom of submarine canyons like today’s Monterey Canyon. Now if you scrap the last part of the route given in the book, and instead stroll north on Adams Street to its end, you’ll find a cute little path running along Cerrito Creek back to San Pablo. Albany Hill and Cerrito Creek have a history of neglectful exploitation, but they have allies today in the Friends of Five Creeks. This entry was posted on 13 November 2011 at 9:37 pm and is filed under Franciscan rocks, Oakland geology views, Oakland geology walks. You can follow any responses to this entry through the RSS 2.0 feed. You can skip to the end and leave a response. Pinging is currently not allowed. Hi Andrew! Love the post. I’d love to run it as a photo gallery on Albany Patch — a community site all about Albany. Would that be all right? Sorry, I don’t permit my posts to be reposted, but thanks for your praise. OK no problem! I may link out to it if I have time. :) Thanks! Why is it called “Catherine’s Walk”? A lovely park making for a fine afternoon trek. Wish I knew. That’s just what it says on the sign by the stairs. Great article. I would point out, for those tempted to stray off the paths or walking their dogs, the hill is profuse with poison oak, huge patches of it.